The Radius of Us highlights human nature, human flaws, trust issues, PTSD, and the internal struggle when you feel as if your life is imploding. It tackles racism, accepting your past, and a whole score of other issues. It might seem like a lot at face value, but it actually strengthens the narrative and pushes it past something other than just another Young Adult romance. 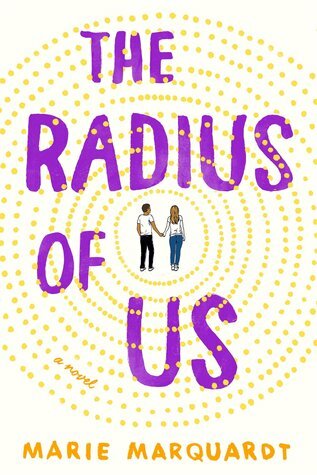 The Radius of Us could have easily slid into the mold of a normal contemporary romance, as many other books I adore have, however, the narrative’s willingness to acknowledge what most contemporary’s gloss over or water down pushed it over the edge of normal. The characters, Gretchen and Phoenix, share a particular voice in the book. The story unfolds in alternating POV chapters, and I think that was a wise decision. Having both voices present balanced the tone and the content of the narrative itself. Gretchen has panic attacks after an attack and attempted robbery six months ago. Phoenix is an illegal immigrant on the run with his younger brother after they were targeted by a gang. These are two very different sides of the same coin, and Marquardt teases out a delicate balance that will leave your senses tingling. The characters themselves, though, are interesting to say the least. For me, the story isn’t really about them even though it is at the same time. The story was about their journey, not their individuality (at least in my head). Both characters were flawed to the point of authenticity. Character flaws can fall on opposite sides of the spectrum, too little or too much, but Gretchen and Phoenix hit the perfect note in the middle. Their individual and joined journeys to overcome and move past their own mental barriers and other tangible obstacles was what made this story more than what it seemed – and it was beautiful. Overall, The Radius of Us is about breaking through the things that hold you back, even if that barrier is yourself. It is a carefully woven tapestry of love, trust, family, and overcoming fear in whatever form it takes. I highly recommend nestling into some blankets and losing yourself in the details and decisions holding this story together.